The exceptional residences of Summerfields West are close to the exciting nightlife of Atlantic City’s casinos and to Philadelphia’s fine restaurants, museums and sporting events. Along with all that the area has to offer, the unmatched home values and comfortable lifestyle at Summerfields West make easy living in an attractive environment simply irresistible. The Temple Companies, a trusted, award winning developer of quality home communities since 1955, has devoted its expertise to developing and managing this professionally designed community. Route 295 South to Atlantic City Expressway East to exit 38 (Williamstowns). 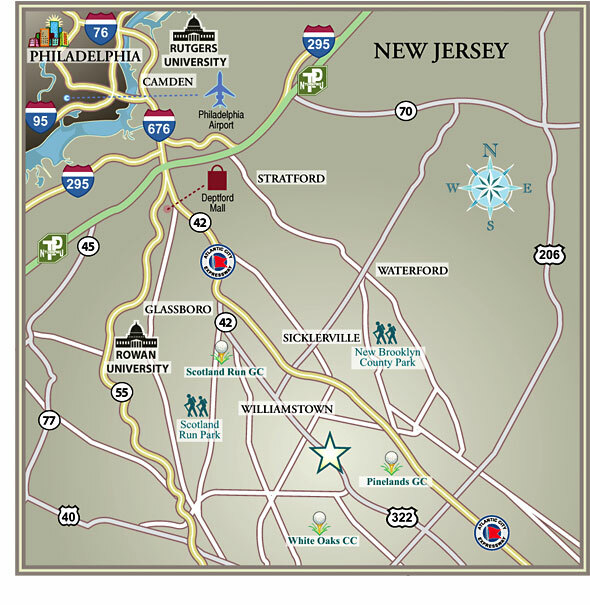 Turn right and follow to Route 322 (Black Horse Pike). Turn left at traffic light on Route 322. Follow Route 322 East for approximately 3 miles to Summerfields West on the left. Walt Whitman or Ben Franklin Bridge to North/South Freeway (Route 42). Merge onto the Atlantic City Expressway to Exit 38 (Williamstown). Turn right and follow to Route 322 (Black Horse Pike). Turn left at traffic light on Route 322. Follow 322 East for approximately 3 miles to Summerfields West on the left. Atlantic City Expressway West to Exit 28 (Hammonton). Turn left and follow to Route 322 (Black Horse Pike). Turn right on to Route 322. Follow 322 West for approximately 7 miles to Summerfields West on the right. Features and prices subject to change without notice. Please consult a sales representative for the most current information. Floorplans: Not to scale, artist's rendering. Room sizes are approximate.